Yesterday, I crawled out from under the huge pile of last week’s laundry and realized that I had no leftover turkey! That just seems so strange. I should be making turkey jambalaya, turkey soup, or turkey sandwiches this week. I suppose it’s really good, though. Usually by the time I’ve used up the left over turkey, I don’t care about seeing, smelling, or tasting another turkey until next Thanksgiving. 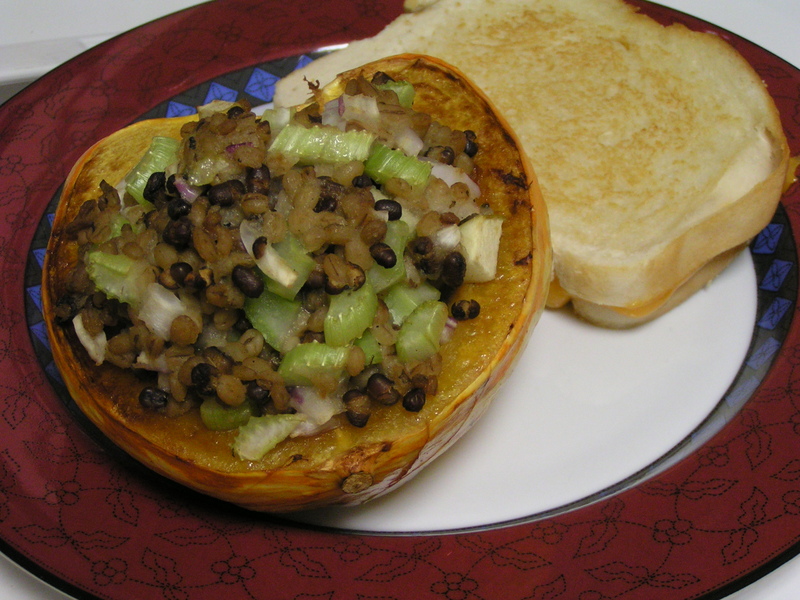 Thus, today for your viewing pleasure…stuffed acorn squash. 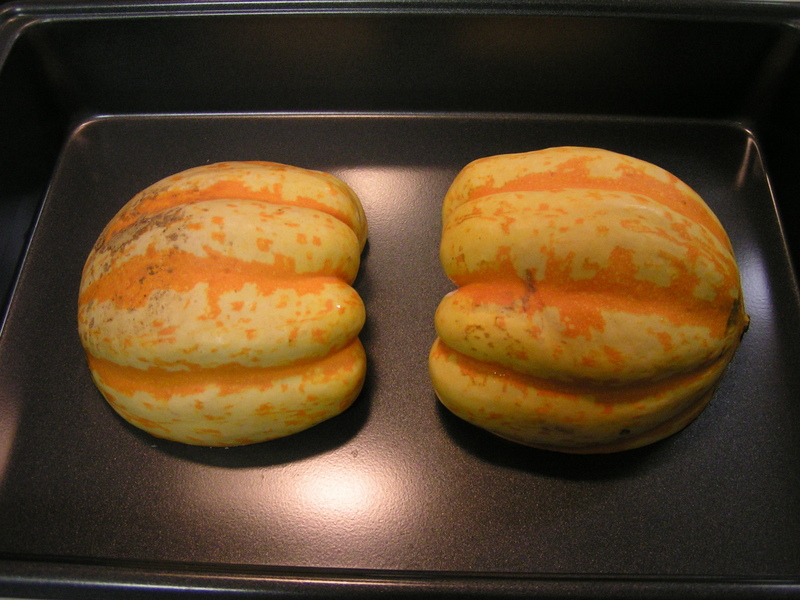 I’ve never cooked an acorn squash before, but they looked so pretty at the market I just had to get one. I think I’m having a squash obsession this year, as I’ve put some kind of squash into every new thing I’ve tried lately. Except the desert-y stuff. 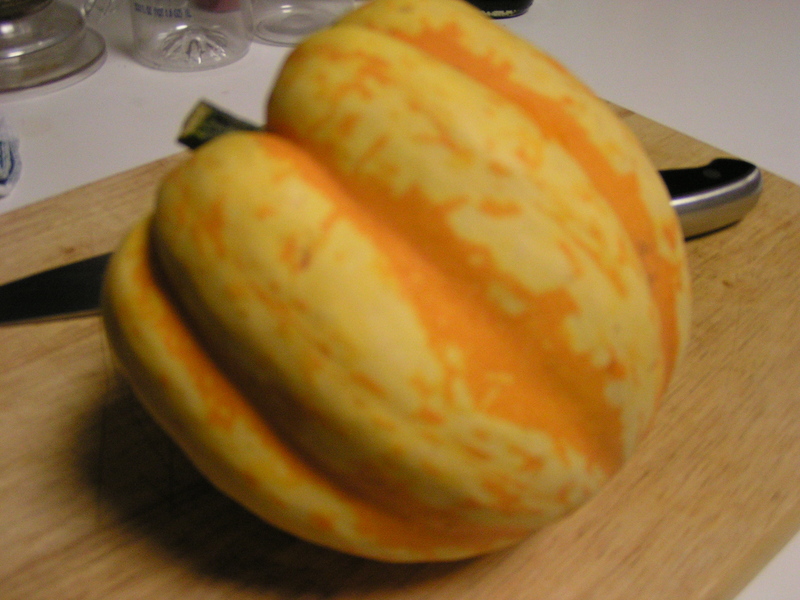 Acorn squash is actually pretty awesome! I did have a moment of “how the hell do you cut this thing?” at first, but it was a lot easier than I thought it would be. I did sharpen the knife first, just in case. 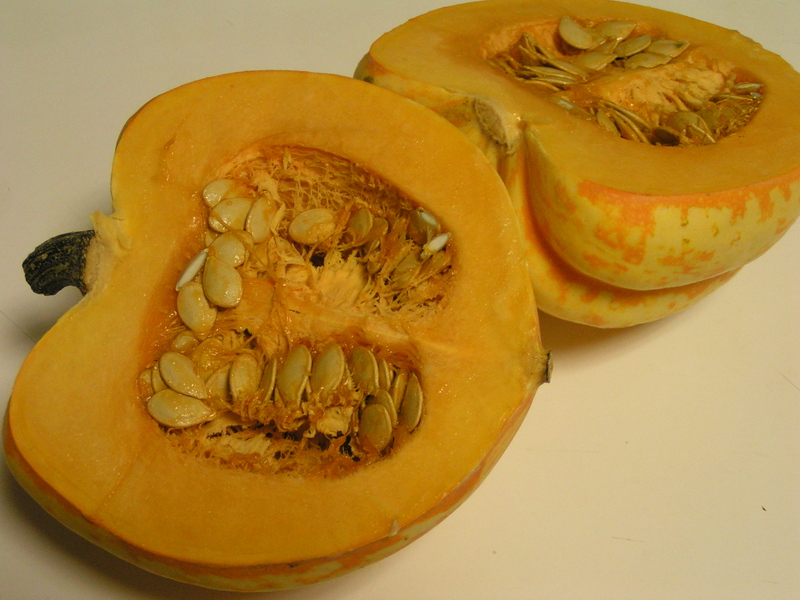 Cut the squash in half and de-seed. I felt like I was playing with tiny pumpkins! Brush both halves lightly with olive oil, and bake at 350F, cut side down, for 30 minutes. To make the stuffing, I used barley and brown rice, cooked to package directions…1 cup of each. 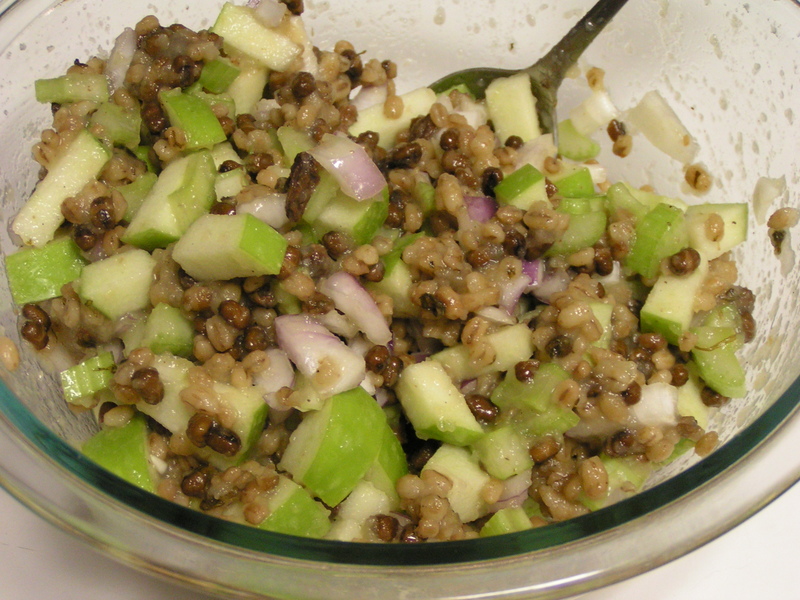 Add 1/2 cup cooked lentils, 1/2 cup chopped celery, 1/2 cup diced shallot, a couple of diced garlic cloves, 1/2 tsp grated ginger, 1/4 tsp ground cinnamon, 1/4 tsp ground coriander, 1/2 tsp chopped fresh mint, 1 cup unsweetened applesauce, and 1/2 cup chopped granny smith apple with the peel left on. While the squash is baking, combine the stuffing ingredients in a medium bowl, and toss to combine. 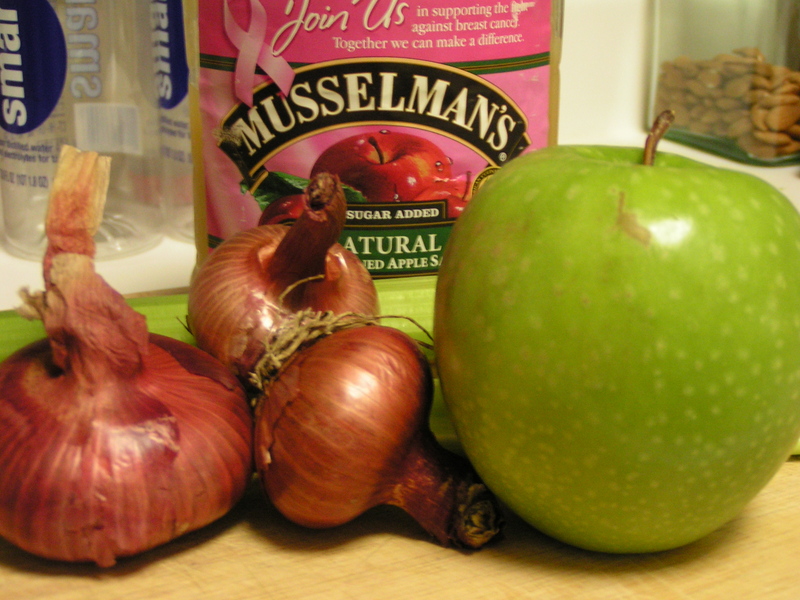 If it’s not moist enough, add a bit more applesauce. This stuffing recipe will fill 2 or 3 squash. I only made 1 because I didn’t know if I’d like the acorn squash. What was leftover will be going in the squash I picked up at the market yesterday, as I really really liked this. I think the stuffing would be great in a zucchini too. 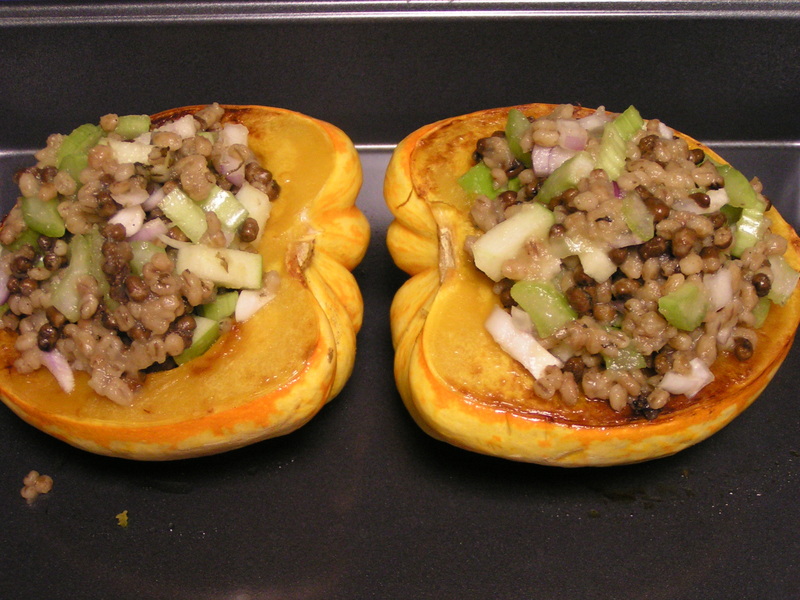 After 30 minutes, remove the squash from the oven, stuff the halves, and bake another 20-30 minutes. this could be a meal in itself, or could be a groovy side! It makes a very pretty presentation. And is ridiculously healthy and yumtastic! I’m making more tonight. The grilled cheese was for Rat Boy. He currently eats like he has 2 hollow legs! This sounds delicious…. I think the only ingredient not in my pantry is the acorn squash. I do believe I will be at HEB soon to remedy that! The stuffing can stand alone, too! I need to get in the habit of buying squash and zucchini. My sis loves it, too. Ok, the barley is cooked, the squash has been through its first baking, the rice is cooking, lentils are cooking and the other veggies/fruit + spices are cut and mixed. I can’t wait for supper tonight! So…. it was a HUGE hit! I made too much stuffing so we tried it in and out of the squash. Both were very successful. The only change I made was replacing the spices with Chinese Five Spice Powder…. I’m lazy! and I used green onions instead of shallots because I had them and they needed to be used. Buttercup asked me to make the celery disappear next time so I will try carrots next time. Thanks for the idea. This will be a standard this winter!